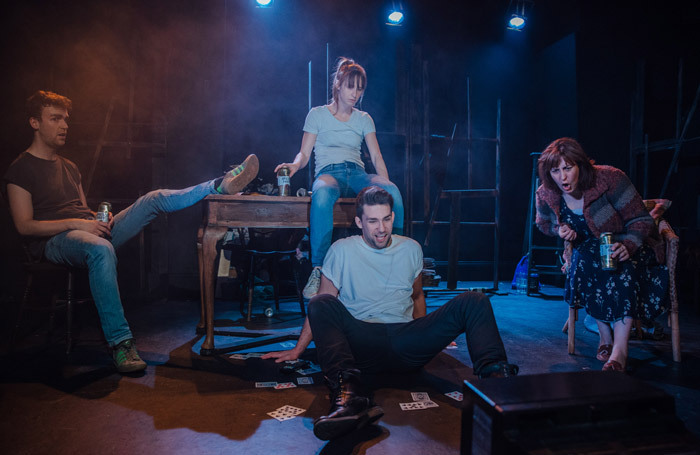 Ed Thomas’ first play, written in 1988, is an anguished portrait of a Welsh mining village in its death throes seen through the lens of the breakdown of one dysfunctional family. Mrs Lewis is holed up with her three adult children in a house occasionally shaken by the explosions from a new open-cast mine cutting into the mountain above. She has created a fantasy around the disappearance of their father and further fevered imaginings come courtesy of the freewheeling spirit of Jack Kerouac’s On the Road, which seems to her vulnerable daughter to provide a far better blueprint for life than the unemployment and desolation of the Valleys. The messy, head-on collision between the two cultures – the idealistic romance of the Beat generation versus rain-lashed Welsh fatalism – is superbly captured by Thomas, and not without humour. Wryly comedic moments involving observations about sheep and a sharp double-take when Mam, confined to a psychiatric ward, appears in traditional shawl and St David’s day bonnet to torment her son, are threaded deftly into the play. James O’Donnell’s production charts a dark descent into horror that unfolds in the flickering firelight. The tone becomes increasingly claustrophobic as the play unfolds. The four actors playing the Lewis family form a compelling unit. Under the direction of O’Donnell, they convey a deep and affecting, ultimately destructive closeness. Evelyn Campbell as the fragile Gwenny and Pete Grimwood as her brother shed their bravado along with their grasp on reality as the extent of the damage is revealed. The overall effect is heartbreaking.